In this FANTASTIC Extra Detail Magnification ("EDM") obtained from yesterday's wonderful VIS image, taken by the NASA - Mars Odyssey Orbiter on January, 14th, 2016, and during its 62.485th orbit around the Red Planet, we can see, once again, a VERY small portion of the Martian Region known as Olympia Undae: an extremely large Dunefield located near the North Polar Cap of Mars. Residual Water Ice and Frost can be easily seen on the East and South-facing Slopes of many Dunes. Furthermore, the Arc-shaped Surface Feature visible TRULY well in this EDM is, probably (let us say most likely but we, as IPF, are not really sure of that), the remaining Rim of an ancient Unnamed Impact Crater, covered by Ice. 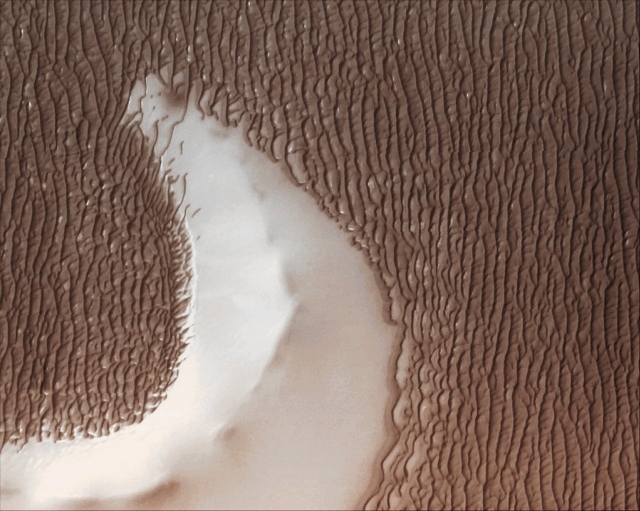 The Dunes of Olympia Undae, as you can see, have surrounded the aforementioned Feature while small Individual Dunes are creeping up its Slopes. This image (which is a sub-crop obtained from an Original Mars Odyssey Orbiter b/w and Map Projected frame published on the NASA - Planetary Photojournal with the ID n. PIA 20436) has been additionally processed, magnified to aid the visibility of the details, extra-contrast enhanced and sharpened, Gamma corrected and then colorized in Absolute Natural Colors (such as the colors that a normal human eye would actually perceive if someone were onboard the NASA - Mars Odyssey Orbiter and then looked down, towards the Surface of Mars), by using an original technique created - and, in time, dramatically improved - by the Lunar Explorer Italia Team.